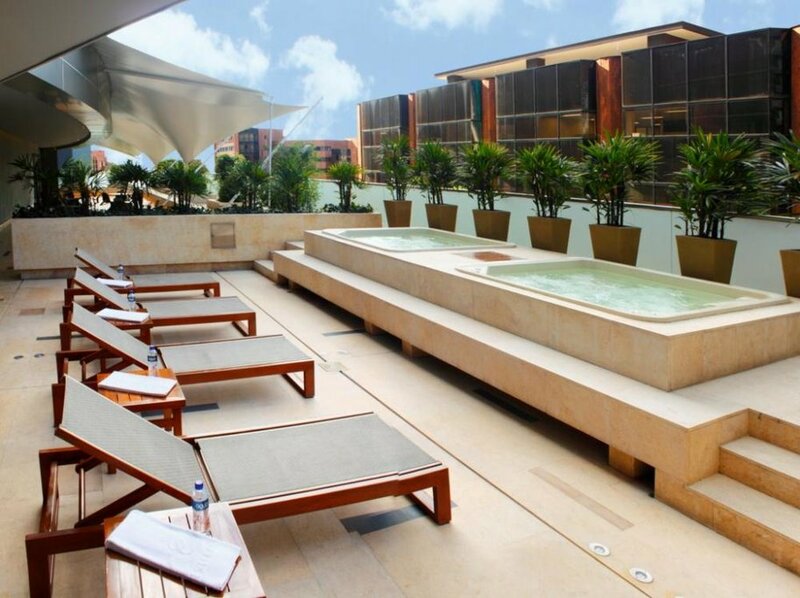 Medellín's variety of hotels cater to everyone. There are super chic options for well-heeled revelers as well as more conservative family-friendly lodgings. Below we’ve selected eight properties that specifically cater to kids, or that are otherwise ideally suited to families. 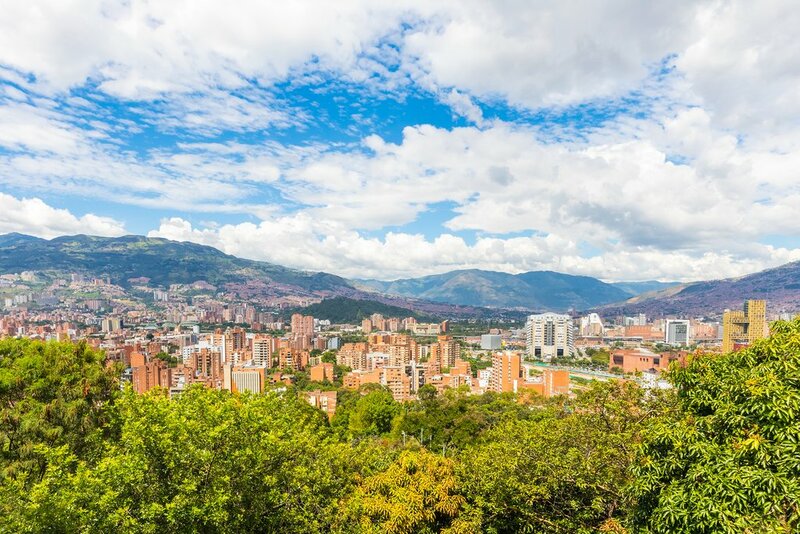 Most hotels in Medellín concentrate in the trendy El Poblado district close to the main restaurant and nightlife zone; so if you or your kids are light sleepers, take noise levels into consideration. That said, Colombians dote on children, and virtually every hotel welcomes kids. Several hotels have pools, plus many hotels have other incentives for families. Below we’ve selected some of the best options offering something for every taste. For more ideas about what activities to enjoy with your kids in Medellín, see this article. 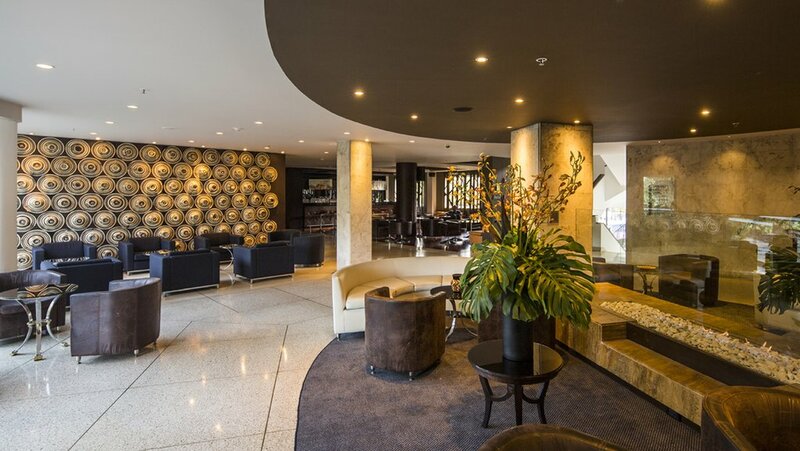 One of the city’s most popular hotels, the stylishly contemporary Dann Carlton, is a large luxury hotel with 200 rooms in five different types. 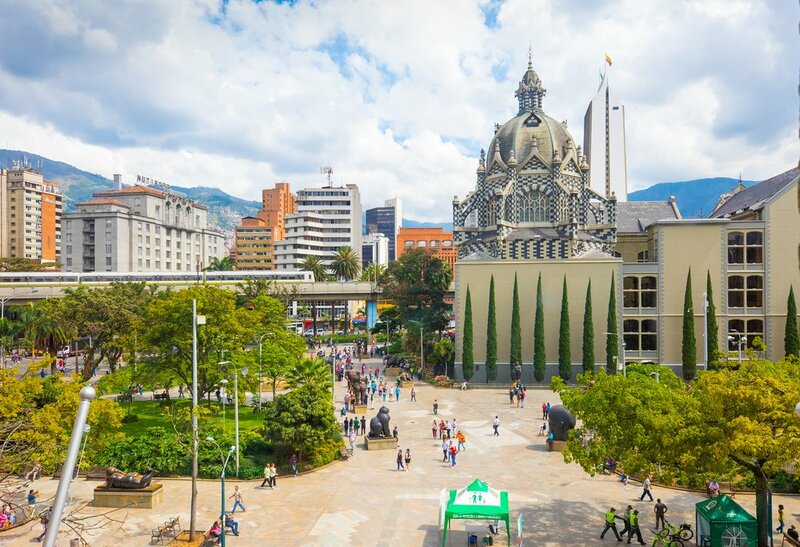 Its location in El Poblado is ideal—it's close to major shopping centers, including the Santa Fé mall, and just a five-minute walk from Parque Lleras, with its variety of upscale restaurants, bars, and nightclubs. Two things we love about the Hotel Dann for families are the large outdoor pool and the rooftop Tony Roma’s restaurant, which revolves 360 degrees as you dine, holding kid’s spellbound. If you prefer the intimacy of B&Bs, then the quaint Hotel Habana Vieja (Old Havana) is right up your alley. A real home-away-from-home, this family-run property has heaps of charm. 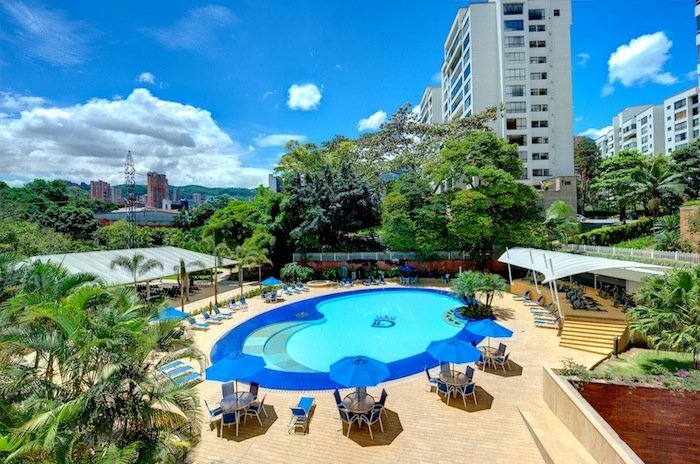 It enjoys a great location on the "Golden Mile" in El Poblado, as it's surrounded by shopping malls and high-rise hotels and office buildings. The Santa Fé mall is a stone’s throw away, plus the B&B has a garden for kids to run around. The name reflects the Cuban décor in the 13 individually themed rooms, including family rooms for up five people. What’s not to like about a stylish budget hostel that has in-house bicycle rental and tours? The Selina offers a selection of themed tours, from City Culture and a cool Gastronomic Bike Tour to a van excursion to nearby Guatapé. And the place is beyond cool. Kids will love the funky style of this eclectic and well-run hostel, where they'll get the added fun of sleeping in bunks in dorms. It also offers private deluxe rooms. Plus there’s an in-house tattoo shop, a yoga deck, and even a playground. The downside? It's noisy. It's a party hostel of the highest order. But if you dig a more communal lifestyle to your digs, this could be for you. Children under 10 eat for free in the Milla de Oro's Restaurante Ocre. Moreover, parents get every third night free when booking a vacation package. This two-for-one deal is temptation enough, but Milla de Oro is also a no-brainer for its chic styling, plus added extras like a spa, solarium, gym, and self-service laundry. Located in the financial district, its main clientele is business travelers, but there are a Starbucks and a Hard Rock Café just a block away, and, always a winner with kids, a McDonald’s one block further. A hotel with its own cinema? You bet! And the movies, offered nightly at 5 pm (some in English), are free at the popular yet bargain-priced Art Hotel Boutique. Renowned for its “warehouse chic” styling, it features concrete floors, exposed bricks walls, and heaps of modern art. No surprise, the average clientele at this chic boutique hotel is young, fashion-conscious, and determined to make the most of the hotel’s party-central location. In fact, the hotel brings the party in-house with its own rooftop lounge bar, so noise may be an issue for light sleepers. Fortunately, the thick brick walls do a good job tamping things down. 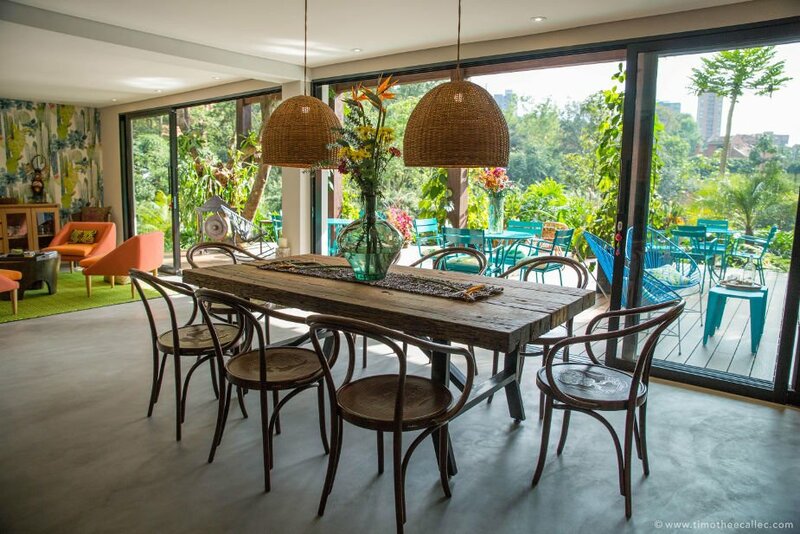 If you prefer family-style intimacy, look to the Patio del Mundo, a lovely boutique hotel in a traditional Colombian villa lovingly restored and run by French hosts. 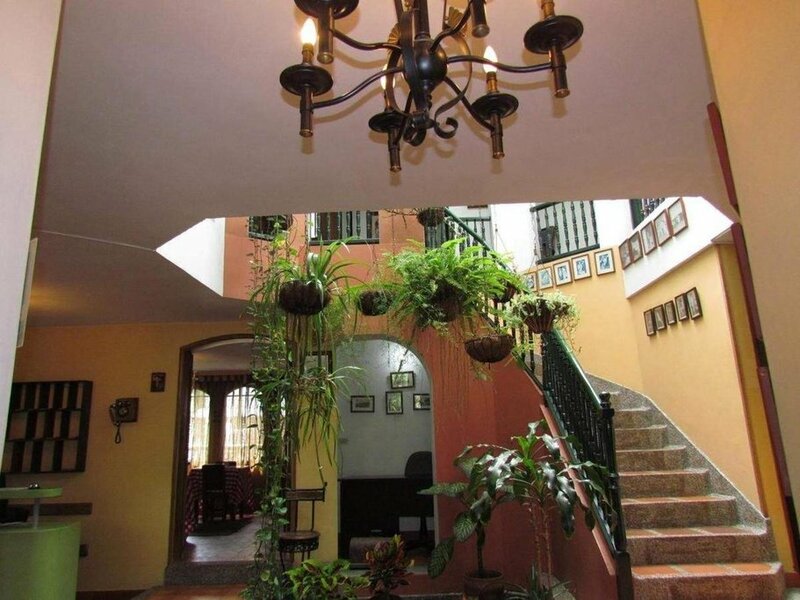 Its large and exquisitely landscaped garden adds to the serenity despite its location in bustling El Poblado. Each of the seven rooms is individually themed with décor spanning the continents. No additional beds are available, so children will have to sleep with mom and dad, and kids below 12 years old aren’t accepted. This really is a calm oasis, so hopefully your adolescents are well mannered. You couldn’t ask for a better location for sightseeing than the Nutibara. This grand dame hotel overlooking Parque Botero, in El Centro, in the heart of downtown. With 128 rooms, it’s a pleasantly medium-sized property that’s not overwhelming. The large, recently renovated rooms boast subdued contemporary styling, while period decor recalling the hotel’s 1940s heyday still grace public spaces. Take an upper-level room for the views; kids will enjoy watching the Metro trains passing by below. The El Centro Metro station is a stone’s throw away. Children who are fussy eaters get a choice of fast-food options in the ground floor food court, which includes a Juan Valdéz Café. All things considered, the hotel is bargain-priced. In lush uplands 30 minutes east of the city, a mere five minutes from the international airport, the elegantly contemporary Movich Las Lomas aims for business travelers but also welcomes families. It has heaps of child-friendly facilities, including a children’s pool (plus an adult pool), as well as basketball, volleyball, and tennis courts. There are also ecological paths where peacocks and ducks wander the grounds. It’s handily located for exploring nearby Guatapé. For more options on what to do just outside of Medellín, see this article.